Your vision + our know how = plantscapes that suit the practical needs and style of your space. We’re proud to partner with homeowners and clients from a wide range of industries including retail, hospitality, business services, real estate, and non-profit organizations. Read on to learn more about our services, including options for plant purchase, plant rentals, and color programs. To see our high-impact horticulture in action, check out Our Work. Plant Parents creates a distinctive indoor plant design tailored to your office or home. 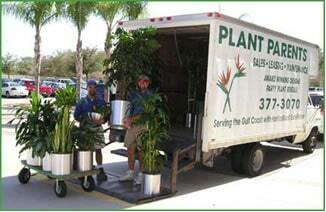 We address site specific needs for office plants and home tropical plants. We evaluate environmental conditions such as light, window orientation, texture, balance, traffic flow and space limitations. Plant Parents also designs exterior planting plans which include entryways, courtyards, lanais and in-ground beds. Plant Parents has a distinctive inventory of tropical plants. Plant selection is important and essential to long term success. Our inventory includes Ficus, Dracaenas, Palms, Bromeliads, Orchids and more. With our help clients choose plants that enhance and complement their offices and homes. We also help clients choose tasteful containers that coordinate with existing furnishings. Container styles include: floor planters, window boxes, hanging baskets, sconces and cylinders. Container materials can be brass, chrome, copper, spun aluminum, ceramic, fiberglass/plastic, stone, and traditional terra-cotta. If you choose to purchase your plants and containers up front your monthly fee for maintenance will be less than if leasing. Plant Parents offers long term plant rental programs that include all plants and containers. A long term rental offers the advantage of an exciting interior plant program that might not otherwise be possible. The client can start a distinctive plant maintenance program with no upfront purchase costs. Office plants and plants for the home are quickly available from our unique tropical plant inventory. Plant Parents can provide short term plant rentals for many special occasions: weddings, parties, proms, school dances, graduations, open houses, trade shows and more! Popular selections include lighted ficus trees, areca palms, or queen palms. We also provide amazing tropical plant groupings with ferns, bromeliads and unique colorful tropical plantings. We collaborate with Party Planners and Event Coordinators to really make a difference while using plants to decorate a wedding or party venue. Our wedding plants and party plants are recommended by many hospitality companies and destination locations, and we can work with your florists or caterer. Our experience has earned Plant Parents a terrific reputation for being creative, ambience improving, professionals, that are on time and fair priced. We have proudly placed “party plants” in tents, auditoriums, country clubs, backyards, ballrooms, stages, gymnasiums, cafeterias churches and museums. Our Tropical Plant Rental enhancements can really hit a home run for the local Sarasota, Venice, Bradenton venues such as; the Crosley Mansion, the Ringling, Philippi Mansion, Selby Gardens, Mote Marine the Van Wezel and more! Our experience makes Plant Parents an excellent choice for enhancing the aesthetics of your next special occasion. Make a statement with green walls. Plant Parents offers a variety of vertical garden style installations, including NextGen Living Walls, BioMontage Moss Walls, and other solutions to create planted portraits, plant walls, green room dividers, and more. Whether you will be starting from scratch with new plants and containers or have existing plantings in need of professional care, we have a plant program that’s right for you. Customers purchase plants and containers. Our licensed professional plant care technicians provide ongoing regular service. Plant replacements are included at no additional charge. Plant Parents rents the plants and containers on a long term basis with ongoing regular service. Plant replacements are included. This is very popular for office plants in small and medium sized companies. Plant Parents maintains client owned or newly purchased plants with regular service (weekly, bi weekly or monthly). Replacements are on a recommended-for-purchase basis. Exterior plantings are serviced as maintenance only. This service is primarily for exterior lanai and patio plantings. Plant service can include clean-ups or check-ups of your houseplants or lanai plants, repotting of container plants, or total “re-do’s” of in ground lanai beds. The cost of this service is usually quoted on a time and materials basis. Everyone loves color, but keeping color year-round is a balancing act. That’s where we come in. Our color rotation programs allow you to get the color you want in your indoor plants or exterior plantings no matter the season. Plants by Plant Parents enhance peoples’ lives. We believe it is important to choose and select the finest quality plants from local and statewide growers. Our team of horticultural technicians and operations associates will proudly transform your home or office into a warm, healthy plant friendly environment. We take pride in being smooth, efficient on time and clean in our plant delivery and plant installations.